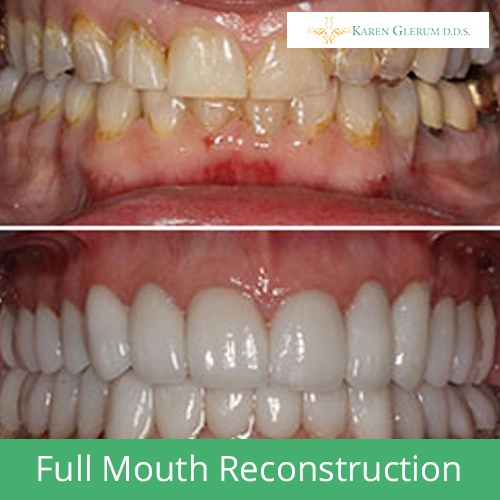 Full mouth reconstruction, full mouth rehabilitation and full mouth restoration are terms often used interchangeably to describe the process of rebuilding or simultaneously fixing (restoring) all of the teeth in both the upper and lower jaws. Full mouth reconstruction typically involves general or restorative dentists (performing procedures like crowns, bridges and veneers), and can incorporate dental specialists like periodontists (gum specialists), oral surgeons, orthodontists (specialists in moving teeth) and endodontists (specialists in tooth pulp infections). Teeth: The condition of your teeth will determine what restorative procedures may be needed, ex: porcelain veneers or full-coverage crowns, inlays or onlays, bridges or implants restored with a crown. In particular, Dr. Glerum will note any cavities and decay, tooth wear, cracks, short/long teeth, root canal issues and any tooth movement. Periodontal (gum) tissues: If your gums are not healthy, you will most likely need scaling and root planing to treat periodontal disease. You may require more intensive treatments from a periodontist to ensure that your newly reconstructed teeth will have a solid foundation. Dr. Glerum will look for deep gum pockets, excessive or insufficient gum tissue, periodontal infection and bone density irregularities. Temporomandibular joints, jaw muscles and occlusion: A stable bite – one in which you are not in pain when you close your mouth or chew and one that does not cause wear or destruction of your teeth – is important to your overall oral health. Occlusal changes need to be taken into consideration when Dr. Glerum plans your restorations. In fact, you may require orthodontics or some other type of treatment (night guard or bite reprogramming orthotic) to correct occlusion before additional restorative procedures can be performed. 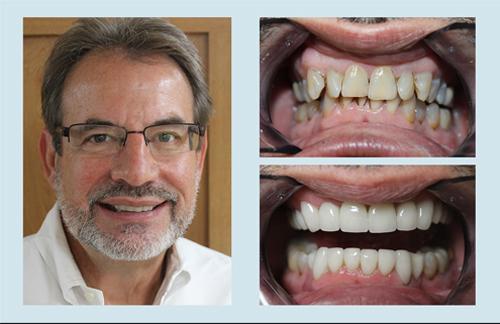 Dr. Glerum has had extensive post-graduate training in bite abnormalities and is an expert at their diagnosis and treatment. Esthetics: The color, shape, size and proportion of your teeth, and how they appear in relation to your gums, lips, mouth, side profile and face, are also important factors in full mouth reconstruction treatment. Dr. Glerum and her team will take photographs of your face, smile and mouth to fully evaluate the esthetics of your case. Once Dr. Glerum has all information relevant to your case, she will develop a comprehensive, step-by-step treatment plan to correct all of the problems in your mouth and complete your full mouth reconstruction. Dr. Glerum will give you a written summary of your conditions and the proposed plan to correct them. This can be helpful if you want to get a second opinion. Be aware that all dentists have vastly differing training, experience and expertise. Do NOT use cost alone to make your decision! As with any service, “you get what you pay for, and you don’t get what you don’t pay for”! Be sure you understand the risks and benefits of the recommended procedures and treatments. Only Dr. Glerum and her team of specialists can determine what procedures are needed for your specific case. Other treatments may also be available, so ask Dr. Glerum about all possible procedures that might be required for your case and under what circumstances. Placement of temporary restorations so you can become accustomed to your new teeth and the feel of your new mouth or bite alignment. The temporary restorations also allow you to “preview” the look of your new teeth. You and Dr. Glerum will carefully evaluate the temporaries and make any changes needed before the final restorations are made. Most full mouth reconstruction cases involve all teeth in the mouth, but every case is unique and depends on your clinical situation. The approximate cost (at a minimum) could be about $800 to $2,000 per tooth. That figure does not include any charges for oral surgery, crown lengthening, periodontal treatments, etc. Dental insurance may pay for some costs associated with full mouth reconstruction. This will depend on the diagnosis and the treatment plan Dr. Glerum has developed, as well as your dental insurance coverage. Dental insurance rarely covers the majority of these costs. Most plans cover between 10% and 30% of the full mouth reconstruction. Third-party financing is usually available through Dr. Glerum’s office to assist you in making affordable monthly payments. If you think you may need Full Mouth Reconstruction, please call our office at 561-374-8922 to schedule a complimentary consultation.